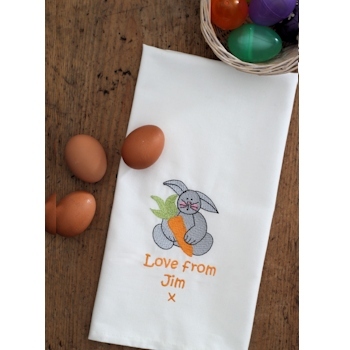 This tea towel makes a cute gift for men, women or children on birthdays, Mothers day and perfect for Easter! Enter the text, thread colour and font style you would like personalised. 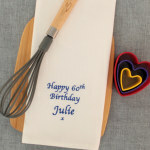 We use your choice of a white cotton tea towel, natural beige tea towel or upgrade to a pure linen tea towel. All styles hemmed on all the sides. 52 x 72cm. Amys Gifts will custom make this gift to order within approx. 1-2 days.